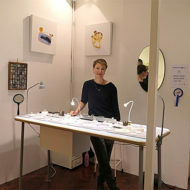 The Gloucestershire Guild of Craftsmen is thrilled to have given our Makers Mark Award at Made by Hand Cheltenham 2019 to Tanja Ufer. The award looks for “a maker with a distinctive voice who can handle materials and techniques with respect and confidence”. Tanja’s jewellery has a quiet and joyful confidence about it. She moves easily between accomplished technique and aesthetic judgment. 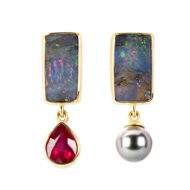 Tanja goes to great effort to choose unusual gemstones that compliment her store of textures collected from the discarded flotsam and jetsam of human activity Her work maintains a freshness and attention to detail; and essentially, is comfortable to wear. This entry was posted in categories; Makers in Focus.